What a year it has been. It never ceases to amaze me how quickly these ten months fly by. We have fifteen days of instruction left before final exams and my students are in their final push to complete their courses. On a personal level, participating in this Cool Tools PD has been eye-opening, a little bit terrifying, and encouraged so much planning for the Summer. I feel that I am on a good path to implementing what I learned this year and hope to learn a little more next year. Having a Twitter account and Facebook login for work has really helped to build a greater sense of community for our staff and students. It’s been great to applaud student achievement and help everyone stay connected even though we don’t get to see each other that often. This is something I hope to continue and expand on throughout the next few months. I plan to create a class blog for my English classes that will give tips and suggestions to help students for each lesson and assignment. This blog will be home to buncees, flipgrids, curated resources, and teaching scaffolds. I hope that once created and uploaded, these resources will help fill in any missing gaps from the course and provide the additional supports my students sometimes need. This PD has also encouraged me to refine our Independent Reading Module for English I and II. Right now, students complete journal prompts, a visual presentation, a book talk, and a written analysis of their book. I would like to give students the option to use some of the digital tools from this PD to demonstrate their understanding of the book. It would be wonderful for students to create a podcast or record their book talk so that it can be shared with students across the District, which might spark a greater interest in reading or discussion about a shared reading experience. I love online learning, but this course was difficult at times because I work best with deadlines. Earlier in the year, a coworker and I came up with due dates for our assignments, but without a hard deadline, I didn’t stick to them. It was also a little overwhelming at times because there is so much wonderful and useful content in this PD. Digital tools are constantly evolving and it feels like as soon as you “catch” up, you’re already ten steps behind again. Since this was my first time participating, I wanted to stick to the first ten tools (I will have to revisit tool ten at a later date). In a way, this was a good thing because I was able to expand my knowledge and understanding on topics like presentation tools and blogging. Overall, this has been a wonderful experience and I am grateful to have been given the opportunity. I spent much of my college and post-graduate work learning how to use databases and search tools. As a dual major in English and Spanish, gathering sources and writing essays was a weekly (and sometimes daily) task. On a professional level, I often use the ACSD, NCTE, and ACTFL databases for up-to-date pedagogy and curriculum ideas. I’m also a New York Public Library card holder and have access to a wide variety of research tools. But when it comes to the classroom, I usually have my students use our good friend Google. As I began to browse through the databases listed on the Cool Tools for Schools Blog, I realized how many great options I have to use with my students. I was most fascinated by InstaGrok and Carrot Search because of their visual layouts. As much as I love Google, these two sites present information in completely new and different ways. information they need when using InstaGrok by clicking on different words and tabs. How often do students, or we as adults, go to the first few links we find on Google and end our search? Pretty often, at least for me. At first glance, Carrot Search is very similar to Google; you type in your query and receive a list of results with a link and a small blurb. When you look closer, you can sort your results by folders, circles, or a FoamTree. Then, your sorting feature pulls of the results based on the link you click! Carrot Search for metaphor with FoamTree sort. These two databases are definitely new tools I would like to share with my students. However, rather than just list them along with databases they are familiar with, I would like students to learn how to use them with specific assignments. This would most likely be in our first module (for all English courses). This way, students will have guidelines and supports to get the most out of each and determine which database works best for them academically. One of the pitfalls of teaching in a virtual setting is not seeing your students every day. Don’t get me wrong, I love my job, and I constantly tell my coworkers that this is the best teaching experience I’ve ever had. However, I’m one of those people that want to be everywhere and do everything at the same time, especially when it comes to teaching. So what do you do when you can’t physically be in the same building with your students every day? You make it work. Over the past two years, VAR staff and I have used every possible resource we could find (that was free) to help us communicate with our kids and each other. When it comes down to a phone call, a text, or daily emails we are on point. It gets a little trickier when we need to talk directly with students. That’s where screen sharing comes in. The Rochester City School District serves almost 30,000 students each year and approximately 11,500 of those students are in high school. When you consider that in combination with the technology our students have access to (i.e. PCs with or without webcams, Chromebooks) some things work for some schools and some don’t. My biggest struggle this year has been getting to my students on a weekly basis. In my department, I pull double-duty as an English and Spanish teacher (and did I mention I am the only Spanish teacher?) and am virtually scheduled at every building we provide credit recovery to. It keeps me busy, but I do feel bad that students don’t see me as often as they want. The solution to this was Zoom.us. It was free and was supposed to bypass the red tape from Google Hangouts, which students cannot access with their RCSD121.org accounts. When communicating with co-workers or vendors, it’s worked great. But we still found red tape, lots of red tape. Not every computer lab had computer monitors with webcams, which meant we needed webcams to be ordered; we also needed headphones with mics. Through trial and error, we determined that students could save an application like Zoom.us to their desktop and use it, but students on chromebooks had to get access from the IT Department at Central Office (essentially unblocking the app or extension). This wasn’t as big of a problem for our English courses because most of our staff were already familiar with the content and how to navigate them. This year, students recovering a Spanish I credit had a course from a different vendor and the navigation was completely different. While we recorded videos and made handouts to help students learn how to navigate this it would have been so much easier to show them either in person or through screen sharing. I was hopeful that I would find a solution and explored ScreenLeap and join.me. ScreenLeap worked on a student account with a chromebook, which was a huge success. It took just a few moments to set up and was easy to use. However, the lack of audio conferencing really negated the ease of use and at $15 a month for premium features, it’s not a great deal. When we tried join.me, we came up against the same system blocks, which was unfortunate because it was easy to use and I loved the chat feature. I also used the application on my iPhone and loved that I could take over with a mouse on my screen or type. The only negative was the price point. Screen sharing is one of the things I plan to tackle this summer so that students have an effective, cost-efficient way of communicating with their meaningful contact teachers. It would benefit the entire department to be able to chat with students from a remote location and show them our screens so that they can visually see, rather than just getting directions by email or phone. So many of my students find speaking about a topic easier than writing about it. Before a project or a larger writing piece, I try to get my students to “talk it out.” I find that they understand the assignments better, include more evidence, and go into the assignment feeling confident. So I was excited to come across some audio tools that would help students demonstrate their understanding in new ways. Since our courses are digital, we use a lot of the Google Apps Suite. I have searched for speech to text extensions in the past but did know I could get speech to text directly in a google doc using Voice Typing until today. I still need to test this with a student account but I am hopeful that our students in need of a tool like this will be able to use it. Google Docs Voice was very easy to use and picked up my speech quickly. I also experimented with FlipGrid and know this is a tool I want to use next year! In the VAR, students are placed in a course section by school. So technically, I could have anywhere from three to seventy students speaking on a discussion board that are in the same building but don’t ever work together on their course in person. FlipGrid would be great to allow students to hear and respond to their peers’ opinions. It took me several tries to record my post before I could upload it, and even then, it wasn’t perfect. I would definitely have guidelines for students and a google doc for students to answer their question and/or jot down notes to use as a reference while recording. If there was ever a cool tool lesson made especially for me, then Thing 6 was it. I am always on the hunt for resources; whether it’s interior design, recipes, toddler crafts, or education, I love finding and saving all types of media. I am a huge fan of Pinterest and use it daily. However, it wasn’t until this lesson, that I realized that I was actually curating. I had always just considered it an “informal” way of digitally scrapbooking things I wanted to come back to without making dozens of bookmarks. Now, I have a brand new perspective. To add to that perspective is the idea that I can teach my students how to curate and why it’s important. I was struck by just how much the world our students are learning in is changing on a daily basis. Our students are living in the Digital Age, and these skills are just as important as any other content-based skills we teach in a classroom. Joyce Valenza argues, “[m]uch of what students now need is dynamic and feedy and cloud-based…We can guide students through the process of setting up parking lots for the development of archiving the inquiry process…” (22). Most of my teaching emanates from student interests and connections. For example, when I teach Romeo & Juliet, I often work to help students make connections between a Shakespearean tragedy and their own coming of age story. I always begin my unit by determining what learning goals I want my students to be able to achieve by the end. However, it is their classroom discussion, reflections, and guidance that gives meaning to our work in the classroom. My teaching has shifted drastically in the past two years because of the nature of my work. My students do not see me every day and at times, they can become frustrated taking a course somewhat independently and completely digitized. The discussion of curating in the classroom also helps to reinforce what I consider to be the most important part of research: finding and evaluating sources. For our English I and II OCR courses, students have to complete a research module. This would be the place to teach my students how and why to curate. For this lesson, I decided to focus on curating from the education side and explored the Civil Rights Movement (covered in English I, Module 3) and used BlendSpace. It was very user-friendly and it was easy to find videos, images, and sites without having to open other tabs (always a plus). I also really appreciate the quiz option in this tool. I think I would definitely use this for assignments to help students build background knowledge on a topic, but I wouldn’t have them personally curate with this tool. My project at the beginning. I came across digital storytelling about two years ago and have been looking for authentic ways to implement it in my curriculum ever since. Of all the digital tools, I think digital storytelling is the most frustrating for me. 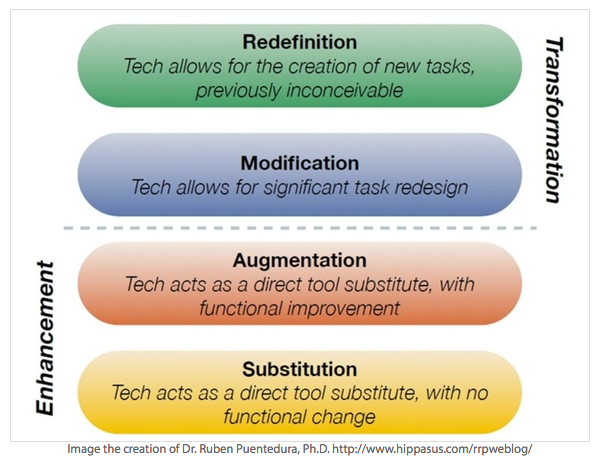 Perhaps it’s because I always go back to the SAMR model. Digital tools are great but they are meant for more than a replacement for paper and pencil. I usually consider myself a creative, think outside of the box, kind of person, and yet, I seem to always hit a roadblock when it comes to this topic. It’s so much of a roadblock that I really, really wanted to pretend this topic didn’t exist. Worries tend to cloud my mind when it comes to this topic: How long will it take to teach students how to use the tool? Will they have access outside of school to work on it? Will students need accounts? Will I have to pay a subscription fee or find a substitute tool each year? and most importantly, Will this reach the level of redefinition? Reluctantly, I decided to give Microsoft Sway a chance. Compared to other digital storytelling tools (I probably should have prefaced this post with a disclaimer that PowToons is my favorite digital storytelling/presentation tool), it was fairly easy and simple to use. I chose to visually illustrate the poem “Cloud” by writer Sandra Cisneros. The program curated images that I could use without worryong abput copyright infringement and matched the images found in the poem. I enjoyed exploring the different layout options for the images and decided to go with a linear design for my example, but really loved the stack option. My students have several opportunities to use digital storytelling in our credit recovery classes. For example, one of the projects in English II is an alternate ending or creation of a short story using elemnts like in medias res, nonlinear narration, foreshadowing, and discovery. Students might even find the assignment easier if they had the use of audio and images, in addition to text. It would be even better if students could take and upload their own photos. Microsoft Slay was much easier to use than I anticipated and I am looking forward to experimenting with it more. It would also be interesting to see what other content areas in my department would be able to utilize this tool. There’s still a lot of exploring to do! Presentation tools have come a long way since PowerPoint! One of my current favorites is PowToons because it’s very user-friendly and you can end up with a really great product. I often search for new presentation tools because I want the look of a professional tutorial or lesson but without a high cost and long production time. So for this Cool Tools challenge, I chose to create a product with Buncee. What made me choose this tool over others? Well, first the background options! There are so many to choose from. I also loved the fonts, animations, stickers, and text options. Buncee allows me to include youtube videos, multiple-choice questions, free-response questions, links, and URLs from the web. I loved all of these options and tried to include a variety of tools in my own presentation (see the link below). At first, I downloaded the Buncee app on my iPad, while I had the same design options, the navigation (mostly, deleting pages) was difficult, and I never did figure out how to delete a slide from the app. Navigating on a PC was much easier for me. It was also easier to curate images and videos because of the extra screen space. If I had to use Buncee again, I would. However, it isn’t as seamless as other presentation tools I’ve used. I didn’t have any options to “animate” slides or create transitions. Through this lens, a tool like PowToons wins hands down. I was hoping Buncee would give me the same flexibility to animate my text, images, and page transitions. I didn’t try to add audio but there are options to record or upload an audio file. Buncee also has a new tool called stitching. After looking at Buncee’s resources guide and playing around with it, I couldn’t quite determine the actual purpose. As a user, and a user that considers herself to be pretty advanced when it comes to presentation tools, this was frustrating. My District currently leases the majority of our credit recovery, virtual AP, and initial credit courses. I as a teacher, can’t go in and edit the course…I can only add or supplement. While we’ve thoroughly vetted our courses, they still aren’t designed how we might teach in a face-to-face classroom. This is why presentation tools are so important! This allows me to supplement our leased courses with additional mini-lessons for students. With a little more practice and training, I’m hoping Buncee will help me to effectively do this. Buncee Presentation: What is an Argument? I should preface this post by saying I have a personal Twitter account I rarely, if ever use. So for this assignment, I decided to start fresh and create a new Twitter handle (@EMartinez_VAR) to use for professional resources and to use as an additional social media source for the Virtual Academy of Rochester (VAR). Aside from setting up my profile, I followed my District and School’s Twitter accounts. Our current Superintendent is a big proponent of social media and has encouraged staff to incorporate this and other 21st Century skills into our teaching practices. I also searched for hashtags that included #tlchat, #slscooltools and followed @edutopia, @jbhanlon, @Alex_Corbitt, and @pollyalida! I really enjoy being able to follow other teachers and find educational resources but it can be very overwhelming. I had to really pace myself about gathering followers because what’s the point of your Twitter feed if it’s only going to overwhelm you? 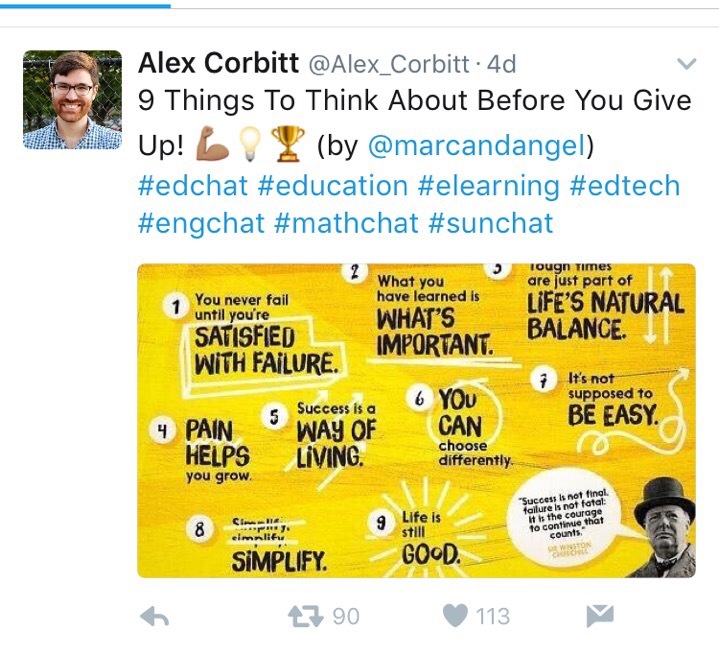 One of the most exciting resources I found during my search was @Alex_Corbitt, an English teacher from Bronx, NY. He posts wonderful graphics and charts with almost every tweet. I found his tweet about perseverance to be especially encouraging and something I would love to share with students (see below). I plan to use Twitter in a variety of ways over the next month and upcoming school year. Twitter will be an extension of my classroom and bulletin board. As I’ve mentioned in previous posts, I do not teach in a traditional class setting and most of my work is done digitally. Twitter will allow my coworkers and I to connect with students, give shout-outs and share moments from our day, and also give tips to our students. Parents and community members will also be able to see the wonderful things going on in our labs. I love my smartphone and I love apps. I’m particularly happy with social media apps likes Facebook and Twitter that help us to connect in 21st century ways, but sometimes I wonder if face-to-face communication will ever be the “cool” thing again. So when Snapchat was released five years ago, I promised myself I would never use it. I didn’t want another app taking up my free time…until this assignment came along. My students all know about Snapchat and most, if not all, have it on their smartphones. It seemed like the appropriate photo app to try. As part of the Virtual Academy of Rochester, my students take their classes online and see me in person every one to two weeks. We use email and phone calls to communicate in between and as a staff, we rely on technology to help us communicate. This year, we have all spent quite a bit of time thinking about how we can create a greater sense of community and between ourselves and our students. While some teachers created twitter handles or Facebook pages, I thought Snapchat would be great to connect with students and show what’s going on in our labs on a daily basis. Here’s what I found out: documenting our experiences with photos on Snapchat is a fun, easy way for students and staff to see what we do on a daily basis. It also helps students feel connected to the Virtual Academy program and teachers they don’t traditionally see every day. The filter options are really fun and addicting (my personal favorite is the floral crown)! I also love that you can add a caption or stickers to photos. I could post a picture of a student to let the rest of the Academy know he or she earned a course credit and list the course and a corresponding sticker. Snapchat is a great tool to celebrate daily student achievements throughout our labs and would help us to strengthen our school community. It would also be a great tool to post announcements about what’s happening in the VAR, weekly reminders, and inspirational quotes to keep students motivated. It’s finally 2017 and this year’s theme is innovation. I have just entered my sixth year of teaching and am so excited to see what this new year brings and how I can evolve my craft. I should probably introduce myself. My name is Elizabeth Martinez and I work for the Rochester City School District in Western New York. I am dual certified in English (7-12) and Spanish (7-12) and have had the pleasure of spending the last year and a half as part of the Virtual Academy of Rochester as an eLearning facilitator. When I saw an email for the Cool Tools PD, I knew I definitely wanted to participate. This won’t just be helpful for my job, which relies heavily on the use of technology, but also because our students need to learn 21st Century technology skills. Bringing technology into the classroom isn’t about the bells and whistles; it’s about teaching our students how to apply skills in a purposeful way. I am always amazed at how quickly technology evolves and how much we can do with it! Blogging gives us a chance to reflect on our own practice, as I will do here with Cool Tools Tech. It also creates a community of learners; something we want for each and every classroom. Blogging can be implemented in every discipline and brings in real-life skills. I can often be heard telling my students that “yes, there was a time when people didn’t have a smart phone glue to their hands…and yes, people survived.” Blogging doesn’t just give us an opportunity to teach the skills/content and encourage collaboration. It requires us to teach students about their digital footprint and the importance of cyber safety. Welcome to Cool Tools Tech and enjoy the ride!